you can use the stored midi songs as an accompaniment when practising your instrument (I play the cornet :-), easily selecting the tempo and the channels you want. Unfortunately the tool named U-Brain to upload midi files to the keyboard is only available for windows. I asked CME several time for information about the upload protocol with no response. Thus you need to prepare your file before uploading, you can't get some midi files from the internet and upload them as-is. edit it with RoseGarden. Muse is also convenient to do the job. 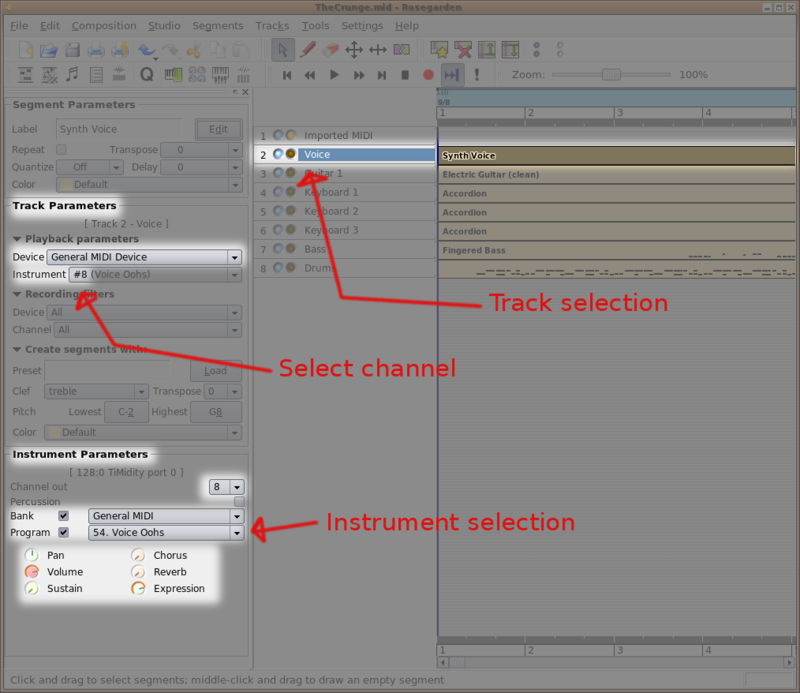 then select a channel in the Instrument list just below. Don't forget that you must leave the drums on the #10 channel. To create a marker with RoseGarden, right-click while on the bar count row and select Insert Marker. A Manage Marker windows is also available when you click Edit Markers in the Composition dropdown menu. once you are done with positioning the markers, I suggest to align them to a bar. Use the Edit Markers tool to do this. 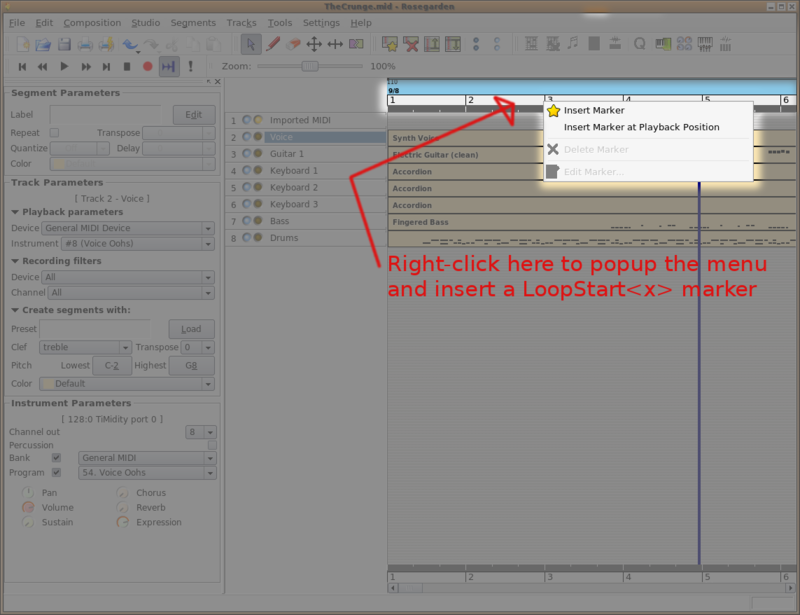 Doing this will allow you to move smoothly from a loop to another when pressing the loop buttons on the U-Key. to create the TheCrunge.ukcsv file. I prefer to store the U-key special midi format as a .ukcsv file because this way it's very hackable with a simple gvim or any command line text processing tools, awk, perl etc. The 2 parameter means you'll upload the midi file to song #2 on the U-key. The hw:1 correspond to the alsa raw midi device to use as output. you may have to switch off/on your keyboard for the midi song to wrok properly. Muse, RoseGarden and midi tools (for amidi) should be available as packages in any decent linux distro. appears only once at the beginning of the file transfer. F0 is the midi code for Sysex, 20 63 is CME manufacturer number song number between 01 and 0F number of blocks that will be sent. Blocks are 1024 bytes long, except the last one which may be less F7 is for sysex end. Note that the 89 code used by CME is illegal if you consider the midi specification : SysEx content should be 7bits contents only, thus data bytes should be between 00 and 7F. This is a real problem with ALSA, see below. Send as many Data blocks as they are 1024 bytes block in the 7bit encoded midi file. On a 8 bytes sequence, the first byte encodes the heaviest bit of the following 7 bytes. Let's explain this with an example, consider we want to send 8F 0F F7 70 70 FF 00. Have a look at the uk7bits C source I provide, you may find it easier to understand. Lol ! Note it's not that often I can enjoy using the <<= operator :-). Having no support from CME I had to drill down the stuff to determine what was the protocol used to upload. Took me a lot of time. One major problem was to find out why the upload process failed even using the exact CME SysEx commands. The reason was usbmidi.c in ALSA source tree : when processing SysEx commands the usbmidi.c automat resets the sending loop when encountering an invalid hex value (between 80 and FF). Thus, when receiving the incorrect 89 hex value defined by CME, it ends abruptly the SysEx command, crashing the upload process. To bypass this I send a 09 value instead, the U-Key keyboard interprets it correctly. Windows doesn't care sending an invalid character in SysEx commands. U-Key Brain. Get it for free from CME download section. As far as I've understood, this hack should also fit for VX keyboard but I couldn't test it.